Always nice to meet a colleague and sharing information! 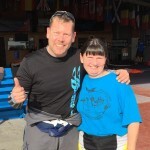 USPA AFF Instructor Examiner Mary Goetsch from Wisconsin, USA visits us at Skydive Spain DZ. Enjoy your stay!